When planning your next party there are some must have essentials you can't forget to have. For one you definitely can't forget snacks and drinks! Arma Energy Snx will give you the boost to keep you partying all night. Whether you are throwing a kickback Super Bowl party or a raging house party we have some tips for you. When hosting a kickback or even throwing a house party having the right snacks are always a plus. Generally everyone sticks with the same-old potato chips, nachos and party mixes but we say snack differently. 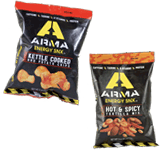 Arma Energy two new snack mixes are perfect for your next party. Given the recent crazies of Four Loko's and Vokda Redbull's these Arma Energy Snacks are the new way to keep your party going all night. These snacks are comparable to the leading energy drink but they wage war on both fatigue and hunger. Cobra (Kettle Cooked BBQ Chips): Smoked BBQ Potato chips cut from the freshest potatoes, kettle cooked in sunflower oil & seasoned with chili pepper & maple sugar. Hellfire (Hot & Spicy Tortilla Mix): Assortment of almonds, peanuts, pepitas and corn sticks mixed with chipotle and paprika, topped off with Cheddar and Romano, packing a zesty flavor. Now that you have snacks that will keep you raging all night its time to check out what drinks you should have. If you're throwing a small kickback you might want to consider having a few cases of craft brew but if you throw a full house party you'll need a lot more than that! Run down to your local liquor store to pick up a few 30 racks or a full keg. If mix drinks are more your style Hard Lemonade and Swamp Frog are perfect for those big parties on a college budget.